Reales coin is a crypto-coin that is backed by physical gold and silver, along with a basket of cryptocurrencies that contains bitcoin and other major bigger players in the crypto market. Being the perfect mix to protect and grow your wealth. Have you ever consider that majority of the ICO’s and Alt-coins in the market don’t hold any intrinsic value, that their values are based purely on speculations and what the founders are promising on delivering? This is one of the main reasons why cryptocurrencies haven’t yet reached broad acceptance in the marketplace. People are having a hard time trying to put their head around the essential facts about the crypto market. As a coin that contains real hard assets (and therefore less volatility than is common to most cryptocurrencies), the Reales coin will attract large numbers of buyers and investors, making it a currency that will be transacted and accepted more widely in the day-to-day marketplace. Other emerging cryptos that are using precious metals as part of their plan have very complex formulas of executions and integrations that might not work as expected, and that therefore create bigger risks for their holders. The Reales coin system is much simpler: Every time someone purchases a token, we will buy physical gold and silver, storing it in existing facilities around the world, without expanding the money supply, linking the direct value of the coins with the value of the precious metals, and thereby creating the perfect hedge for storing wealth in the blockchain. We have a strong belief in the future of the crypto movement, so Reales coin will have its foundation also based in bitcoins and other alt-coins. Instead of adding just another coin to the thousands of coin in the market and competing against them, we strongly believe that we can all benefit from the overall continuing growth of bitcoin and emerging cryptos with the uniquely designed Reales coin. Reales holders will get a prime spot in the market by always having an advantage and a seat in widely growing market, with a truly diversified portfolio provided by its unique composition of both precious metals and major cryptocurrencies. Reales coin will have its own magic tool for investments. We are working on the development of a specially crafted software called “COMET” (Crypto Metadata Entry Tracker). COMET will be the telescope of the crypto market - by having real-time data feeds from the web, we will be able to track how much and how often people are talking about, hash-tagging, mentioning or posting about certain alt-coins and ICO’s, thus enabling us to be one step ahead of the game in predicting what could happen with a specific crypto. That way we will always hold the advantage on what moves to make, by having our fingers on the pulse of social media mentions. Many of us have already had experience of just one little mention by any big figure out there rapidly changing the value of a coin. 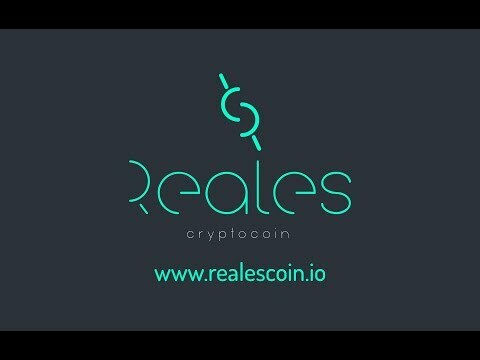 Creation of Reales Hall of Decisions where people using the Reales Token (RLS) can vote and submit proposals regarding future of Reales Coin. Having an Inclusive space never seen before.